The day after Portland Trail Blazers guard C.J. McCollum sank the game-winning floater with 3.9 seconds left against the Dallas Mavericks, he met with 20 students from Madison High School’s journalism club. For the second year, he’s encouraging Portland-area students to pursue a career in journalism through his student mentoring program, CJ’s Press Pass. McCollum is a silent assassin on the court, and off the court he’s a blooming journalist, radio personality and philanthropist. As he continues his effort to invest in the local community, he will host Journalism Night on Feb. 13 during the Blazers’ home game against the Atlanta Hawks, where the students will receive media credentials and attend a postgame news conference through CJ’s Press Pass. The program provides aspiring journalists the opportunity to attend events with McCollum, receive personalized mentorship from members of the media and to have their work published. This year, CJ’s Press Pass is partnering with Prep2Prep, a Bay Area organization that gives students the opportunity to cover local high school sporting events and receive mentorship. The Blazers star earned a degree in journalism from Lehigh University in 2013. He started off in the business school at Lehigh. About two weeks into it, he realized it wasn’t for him. He was an assistant editor for the school newspaper for three years and now that he’s in NBA, he hosts two radio shows: Playlist, a two-hour show on iHeartRadio that airs on Friday nights from 10 p.m. to midnight, and a weekly sports talk morning show on 620 Rip City Radio. For McCollum, starting CJ’s Press Pass was a no-brainer. The students will produce a column, video or podcast. Local journalists will be on hand for an exclusive Q&A session. The assignments will be submitted to McCollum and the student with the best piece will be recognized on March 24, when the students visit the iHeartRadio station to watch McCollum tape one of his shows. As a radio personality, McCollum said, he enjoys talking sports and music. The best advice he gives to student journalists in his program is not to be afraid to go against the norm. McCollum also partnered with the Boys & Girls Club to launch the first CJ McCollum Dream Center. C.J. 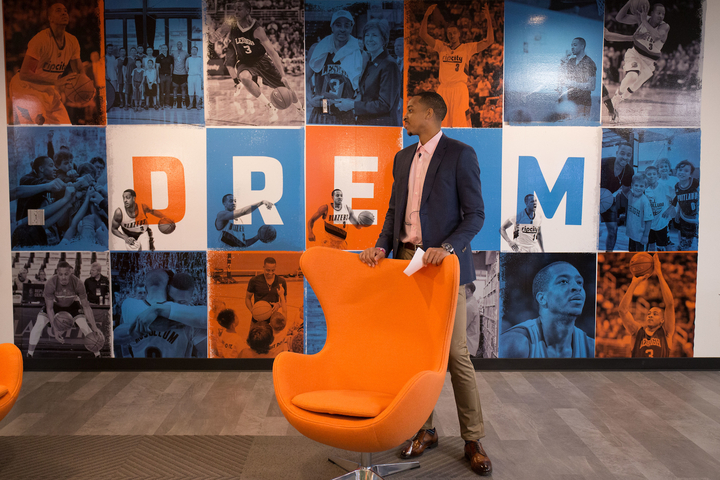 McCollum at the opening of the CJ McCollum Dream Center inside the Blazers Boys & Girls Club on Nov. 7, 2016. McCollum said it’s the first Dream Center of many, as he aspires to open two more.